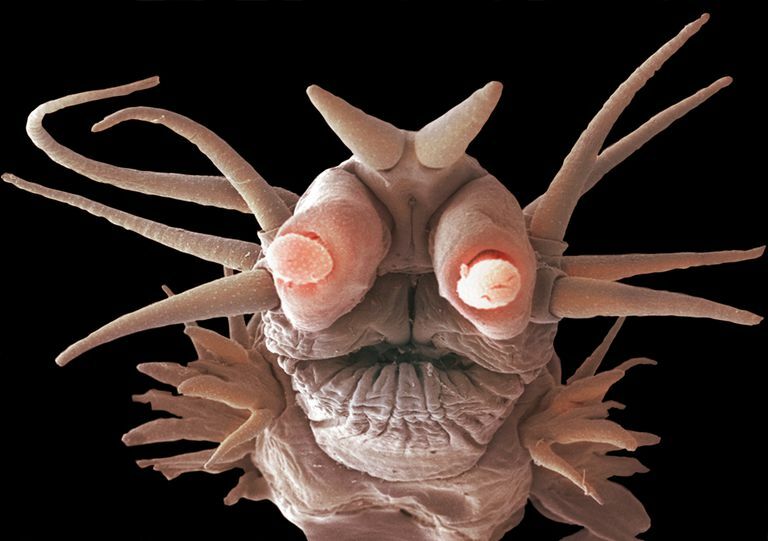 This deep ocean worm (Nereis sandersi) lives off of the minerals from hydrothermal vents using the process of chemosynthesis. Chemosynthesis is the conversion of carbon compounds and other molecules into organic compounds. In this biochemical reaction, methane or an inorganic compound, such as hydrogen sulfide or hydrogen gas, is oxidized to act as the energy source. In contrast, the energy source for photosynthesis (the set of reactions through which carbon dioxide and water are converted into glucose and oxygen) uses energy from sunlight to power the process. The idea that microorganisms could live on inorganic compounds was proposed by Sergei Nikolaevich Vinogradnsii (Winogradsky) in 1890, based on research conducted on bacteria which appeared to live from nitrogen, iron, or sulfur. The hypothesis was validated in 1977 when the deep sea submersible Alvin observed tube worms and other life surrounding hydrothermal vents at the Galapagos Rift. Harvard student Colleen Cavanaugh proposed and later confirmed the tube worms survived because of their relationship with chemosynthetic bacteria. The official discovery of chemosynthesis is credited to Cavanaugh. Organisms that obtain energy by oxidation of electron donors are called chemotrophs. If the molecules are organic, the organisms are called chemoorganotrophs. If the molecules are inorganic, the organisms are terms chemolithotrophs. In contrast, organisms that use solar energy are called phototrophs. Chemoautotrophs obtain their energy from chemical reactions and synthesize organic compounds from carbon dioxide. The energy source for chemosynthesis may be elemental sulfur, hydrogen sulfide, molecular hydrogen, ammonia, manganese, or iron. Examples of chemoautotrophs include bacteria and methanogenic archaea living in deep see vents. The word "chemosynthesis" was originally coined by Wilhelm Pfeffer in 1897 to describe energy production by oxidation of inorganic molecules by autotrophs (chemolithoautotrophy). Under the modern definition, chemosynthesis also describes energy production via chemoorganoautotrophy. Chemoheterotrophs cannot fix carbon to form organic compounds. Instead, they can use inorganic energy sources, such as sulfur (chemolithoheterotrophs) or organic energy sources, such as proteins, carbohydrates, and lipids (chemoorganoheterotrophs). Chemosynthesis has been detected in hydrothermal vents, isolated caves, methane clathrates, whale falls, and cold seeps. It has been hypothesized the process may permit life below the surface of Mars and Jupiter's moon Europa. as well as other places in the solar system. Chemosynthesis can occur in the presences of oxygen, but it is not required. This is much like the reaction to produce carbohydrate via photosynthesis, except photosynthesis releases oxygen gas, while chemosynthesis yields solid sulfur. The yellow sulfur granules are visible in the cytoplasm of bacteria that perform the reaction. Another example of chemosynthesis was discovered in 2013 when bacteria were found living in basalt below the sediment of the ocean floor. These bacteria were not associated with a hydrothermal vent. It has been suggested the bacteria use hydrogen from the reduction of minerals in seawater bathing the rock. The bacteria could react hydrogen and carbon dioxide to produce methane. While the term "chemosynthesis" is most often applied to biological systems, it can be used more generally to describe any form of chemical synthesis brought about by random thermal motion of reactants. In contrast, mechanical manipulation of molecules to control their reaction is called "mechanosynthesis". Both chemosynthesis and mechanosynthesis have the potential to construct complex compounds, including new molecules and organic molecules. Campbell N.A. e.a. (2008) Biology 8. ed. Pearson International Edition, San Francisco. Kelly, D. P., & Wood, A. P. (2006). The chemolithotrophic prokaryotes. In: The prokaryotes (pp. 441-456). Springer New York. Schlegel, H.G. (1975). Mechanisms of chemo-autotrophy. In: Marine ecology, Vol. 2, Part I (O. Kinne, ed. ), pp. 9-60. Somero, G.N. Symbiotic Exploitation of Hydrogen Sulfide. Physiology (2), 3-6, 1987.